The head and back of this finch are brown whilst the throat and underparts are white with brown bars; the tail is black. In both sexes there is a claret or plum-coloured spot on the head above a small black eye-stripe, but only the male has a dark spot on the chin. Legs and feet are pinkish-brown, eyes dark brown to black, bill black. 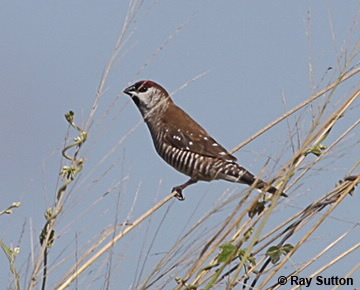 These gregarious birds can be occasionally seen in open woodland feeding on grass seeds. They are sometimes known as the cherry finch.